The Qin Dynasty saw rich cultural and technological innovation, but brutal rule, and gave way to the Han Dynasty after only 15 years. The leader of the victorious Qin state established the Qin Dynasty and recast himself as Shi Huangdi, the First Emperor of China. The Qin Dynasty was one of the shortest in all of Chinese history, lasting only about 15 years, but was also one of the most important. It was marked by a strong sense of unification and crucial technological and cultural innovation. Shi Huangdi standardized writing throughout the empire, built expansive infrastructure, such as highways and canals, standardized currency and measurement, conducted a census, and established a postal system. Legalism was the official philosophy, and other philosophies, such as Confucianism, were suppressed. Shi Huangdi also built the Great Wall of China, roughly 1,500 miles long and guarded by a massive army, to protect the nation against northern invaders. The Qin Dynasty collapsed after only 15 years. There was a brief period of chaos until the Han Dynasty was established. Mandate of Heaven: The belief, dating from ancient China, that heaven gives a ruler the right to rule fairly. Legalism: A Chinese philosophy claiming that a strong state is necessary to curtail human self-interest. Great Wall of China: An ancient Chinese fortification, almost 4,000 miles long, originally designed to protect China from the Mongols. 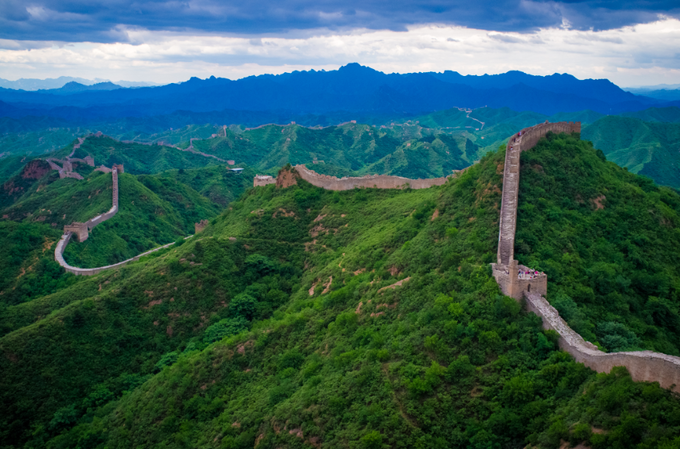 Construction began during the Qin Dynasty, under Shi Huangdi. When the Qin state emerged victorious from the Warring States period in 221 BCE, the state’s leader, King Zheng, claimed the Mandate of Heaven and established the Qin Dynasty. He renamed himself Shi Huangdi (First Emperor), a far grander title than King, establishing the way in which China would be ruled for the next two millennia. Today he is known as Qin Shi Huang, meaning First Qin Emperor. He relied on brutal techniques and Legalist doctrine to consolidate and expand his power. The nobility were stripped of control and authority so that the independent and disloyal nobility that had plagued the Zhou would not pose a problem. The Qin Dynasty was one of the shortest in all of Chinese history, lasting only about 15 years, but it was also one of the most important. With Qin Shi Huang’s standardization of society and unification of the states, for the first time in centuries, into the first Chinese empire, he enabled the Chinese to think of themselves as members of a single kingdom. This laid the foundation for the consolidation of the Chinese territories that we know today, and resulted in a very bureaucratic state with a large economy, capable of supporting an expanded military. The First Emperor divided China into provinces, with civil and military officials in a hierarchy of ranks. He built the Lingqu Canal, which joined the Yangtze River basin to the Canton area via the Li River. This canal helped send half a million Chinese troops to conquer the lands to the south. Qin Shi Huang standardized writing, a crucial factor in the overcoming of cultural barriers between provinces, and unifying the empire. He also standardized systems of currency, weights, and measures, and conducted a census of his people. He established elaborate postal and irrigation systems, and built great highways. The Great Wall of China: Sections of the Great Wall of China, from the part known as Jinshanling. In contrast, in line with his attempt to impose Legalism, Qin Shi Huang strongly discouraged philosophy (particularly Confucianism) and history—he buried 460 Confucian scholars alive and burned many of their philosophical texts, as well as many historical texts that were not about the Qin state. This burning of books and execution of philosophers marked the end of the Hundred Schools of Thought. The philosophy of Mohism in particular was completely wiped out. Finally, Qin Shi Huang began the building of the Great Wall of China, one of the greatest construction feats of all time, to protect the nation against barbarians. Seven hundred thousand forced laborers were used in building the wall, and thousands of them were crushed beneath the massive gray rocks. The wall was roughly 1,500 miles long, and wide enough for six horses to gallop abreast along the top. The nation’s first standing army, possibly consisting of millions, guarded the wall from northern invaders. 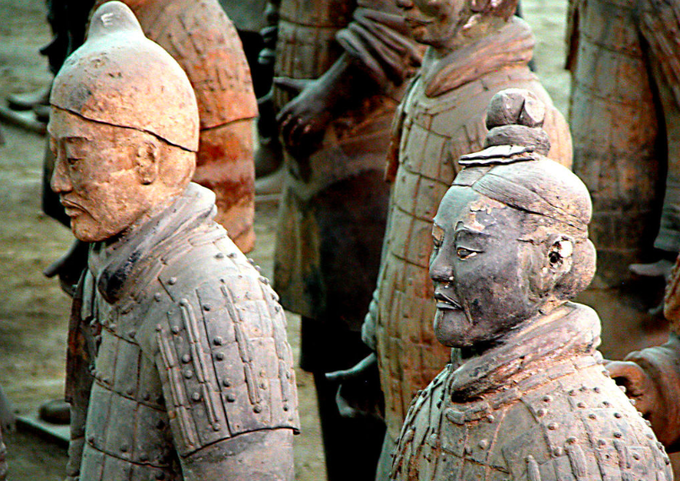 The Terracotta Army: A close-up of two soldiers in the terracotta army. Note how their faces differ from each other—each soldier was constructed to be unique. Another of Qin Shi Huang’s most impressive building projects was the preparation he made for his own death. He had a massive tomb created for him on Mount Li, near modern-day Xi’an, and was buried there when he died. The tomb was filled with thousands and thousands of life-sized (or larger) terracotta soldiers meant to guard the emperor in his afterlife. This terracotta army was rediscovered in the twentieth century. Each soldier was carved with a different face, and those that were armed had real weapons. The First Emperor’s brutal techniques and tyranny produced resistance among the people, especially the conscripted peasants and farmers whose labors built the empire. Upon the First Emperor’s death, China plunged into civil war, exacerbated by floods and droughts. In 207 BCE, Qin Shi Huang’s son was killed, and the dynasty collapsed entirely. Chaos reigned until 202 BCE, when Gaozu, a petty official, became a general and reunited China under the Han Dynasty.